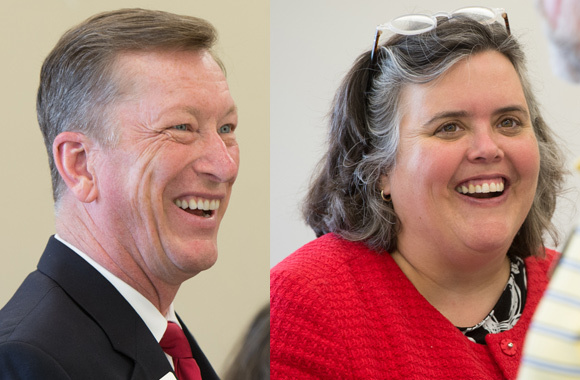 Chancellor Randy Pembrook recently named a new provost and a new vice chancellor for administration. Denise Cobb, PhD, has been named provost and vice chancellor for academic affairs. Cobb served as the interim provost since October 2015. Prior to that appointment, she was assistant provost for academic innovation and effectiveness, and then associate provost for academic affairs since June 2012. Cobb joined the SIUE Department of Sociology and Criminal Justice Studies in 2003 as an assistant professor in sociology and was promoted to professor in 2015. As a faculty member committed to interdisciplinary scholarship, she has co-authored and co-presented with colleagues from a wide variety of disciplines on such topics as capstone experiences for college students and LGBT issues in criminal justice education. Rich Walker has been named vice chancellor for administration (VCA). Walker stepped into the role of interim vice chancellor for administration when former VCA Kenn Neher retired in May 2016. Prior to serving as interim VCA, Walker had served as the assistant vice chancellor for administration for planning and budgeting since 2001. “Rich has performed excellently in the interim role, and we determined that the University needs to capitalize upon his experience, institutional knowledge and community relationships during a time period when stability is required,” said Chancellor Randy Pembrook. Walker provides leadership to the SIUE community and to the VCA directors in matters related to long-range facility planning and budget development. He has been responsible for the development of the University’s annual capital RAMP budget and the development, submission and implementation of the VCA functional area budget.